Recently I taught a set of classes about the time of the Judges. The background to this time in history is one of a repeating cycle. To illustrate the idea of a cycle that goes round and round I decided to use a hoola hoop. Each week, as we studied our way through the Judges I used part of the class time to review this cycle. Soon the children were able to explain this to the others in the class. The rattle sound the hoola hoop made as it turned added to the fun. If a hoola hoop is not available then use any circular object that can be rotated and used in the same way. A bicycle wheel, hubcap, pizza pan or a round piece of cardboard would work just as well. Write each of the stages of the cycle on thick card and tape them to the hoola hoop to form something like a wheel that can be rotated round and round. God protected his people as they obeyed him. Then the people strayed from God and even started worshipping false Gods. Because they left God they also left his protection. When the enemies began to hurt them they had no protection from God. This was a terrible time. Finally, after so many bad things were happening, the people realised their mistake and cried out to God for help. Even though the people forget God, God never forgot his people. When his people cried out for help he would send a hero (called a Judge) to save the day and turn them back to him. Sometimes these heroes were soldiers, sometimes they were very clever. At least once they were a bit wild and crazy (Samson). God knew what kind of judge they needed.And the cycle continues…The judge would bring the people back to a time of safety with God (repeat number one again). Sometimes many years would pass but then, the people began to forget again…(and this is where you continue to number two and so on). Hey, Let’s Look in the Bible! A simple and effective Bible class activity that has been around for quite some time is one in which individual words from a Bible verse are spread out on a table and children unscramble them. Click here for full instructions for Unscramble the Verse. Usually I would have the class read the verse in the Bible before unscrambling the verse. But awhile back I decided to try something different. I divided the ten children in the class into 2 mixed-age groups and gave each group a duplicate set of scrambled words. All I told them was that it was a Bible verse. The children quickly set to work trying to figure out how to put the words in order. I observed both teams using logical methods to figure out this puzzle. They tried to work out sentence structure. They placed question marks and full-stops (periods) at the ends of lines since those would end sentences. Words that started with capitals were the first words in sentences. But, it was a complicated verse and they were truly stumped for the answer. I could tell both groups were getting a little frustrated. It would have been easy for me to bail them out right away but I actually wanted to let them feel that frustration for a little while. I wanted them to feel what it is like to work really hard but not be able to figure it out on their own before pointing them to God’s Word..
Of course, I wouldn’t have let that frustration go on so long that the children would give up or become discouraged. So, just when I was about to “break” and give them a hint, one of the youngest children popped up with this suggestion, “Hey, let’s look in a Bible for the answer!” Both groups scrambled to find a Bible and look up the passage. The answer was there all along! How often do we try to figure out life on our own without seeking answers from God’s word? How many times do we feel that frustration but look to other sources for answers? Let’s help guide children towards God and what he has to say so that it will become a natural part of their life. All you need for this visual aid is a bible, 1 piece of paper and a pen or pencil for each child. Before teaching your class you will read over the Bible story and divide it into main points. I suggest you draw these yourself as practice so you know it will work! Provide each student with a piece of paper and something to write with. Tell them how many parts of the story there are going to be (your main points) and ask them to draw that many squares on the paper. As you tell the story (or read it straight from the Bible) the children will fill in the squares with drawings. Guide them in this as much as is needed. 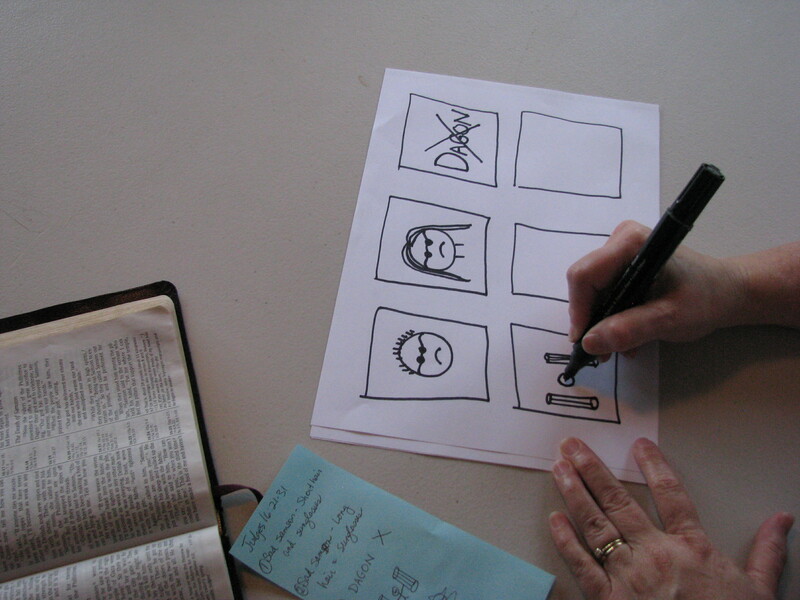 Older children could read the story from the Bible themselves and draw. When everyone is finished they can tell the story to the class using their own pictures. I think you’ll like this teaching idea because it can be adapted to any story. For full instructions, templates, examples and other ways to adapt this idea click here. As an example I used the Bible Story: Death of Samson from Judges 16:21-31. Contents have been moved to the Background Information for the Judges page.